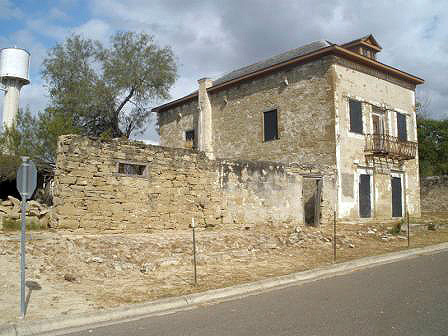 The Noah Cox house, a stately two-story masonry residence, sits vacant on the plaza within the City of Roma’s National Historic Landmark District. The property’s fort-like architecture features represent the perils of early border settlement and the blend of Mexican, Spanish and Anglo-American architectural traditions which illustrate the history of South Texas and life along the border. Built around 1853 by a local architect, the Cox house has been owned by the descendents of Noah Cox since 1856. Cox (1830-1883) was an early pioneer, attorney, and public servant. As a civic leader he held various positions: Deputy District Clerk, Commissioner of Indian Affairs, signer of the Texas Order of Session of 1861, officer in the Confederate Army and County Attorney. Vacant since 1987, the Noah Cox House is endangered due to a significant loss of historic fabric through neglect. The heirs have struggled to maintain the building and recently raised money to repair the roof. Originally, the property contained a six-foot high stone fence, but due to deterioration little of it remains today.